Greetings to all! I want to provide a brief recap on what your children heard in school last week. The entire Academy – Rev. George A. Brown, the Middle School, and Pope John XXIII High School – must be on the cutting edge in preparing our children for post-secondary education and beyond. Our alumni return to visit us from college and to a person respond with a resounding “yes” when asked if they are well-prepared. We intend to keep it that way, and the administration, guidance personnel, faculty and staff at the high school are increasingly aware of the steep competition in post-secondary education. Our course offerings and our new partnership with Project Lead The Way (PLTW) will put us in an entirely new category of college prep, one that is certainly unique to our area. 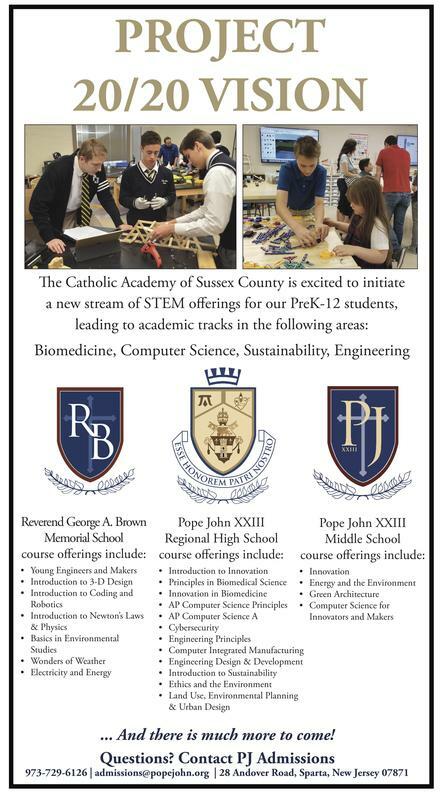 You can see from the enclosed flyer (which appeared as a full-page ad in last Sunday’s New JerseyHerald), all three schools will be offering courses leading to tracks in Biomedicine, Computer Science, Sustainability, and Engineering at the high school level. In fact, some of the subject matter listed is already being taught in our schools. Academy faculty will receive extensive professional development through PLTW as the program rolls out. I have no doubt that one of the new items brought home was that the old gym in the high school will be air-conditioned (and this project is already underway). For those of you who have ‘roasted’ in the old gym during school liturgies, meetings, concerts, and special events, you know this will bring long-awaited relief! The price tag for our comfort is $168,000.00, and the cost of the project is a gift to us from a former parent and grandparent. While we have received two very noteworthy gifts from former students, their largesse will not entirely cover the cost of the proposed science center. However, just as we have in the past, we will build on their generosity, and the project – which will certainly enhance Project 20/20 Vision – will be financed by gifts and donations. We will fundraise and ask for your financial support to complete construction and equip the science center, which will benefit the entire Academy. I will keep you posted as plans progress. So, what else can you do? Why not build on the enthusiasm that the children brought home? Share the news of Project 20/20 Vision with your friends and neighbors! We are all very excited about this new venture, and we hope that you are excited about it, too. Project 20/20 Vision will begin in September 2019. Needless to say, the world is changing rapidly. You, yourselves, have to adjust and adapt to those changes in the work force each and every day. We cannot avoid the changes – even in bucolic Sussex County. As a former parent said to me over a year ago, “If you rest, you rust.” We do not intend to send any ‘rusty’ children off to college! Very best wishes and thank you in advance for your continued support. P.S. I’ve used Jeremiah 4:3 quite a bit this year: “Till your untilled ground, sow not among thorns.” Let us work together as the Academy community PreK-12 and till the untilled ground so that there will be a rich harvest of success for your children.